– Stop the new anti-union Labour Code . 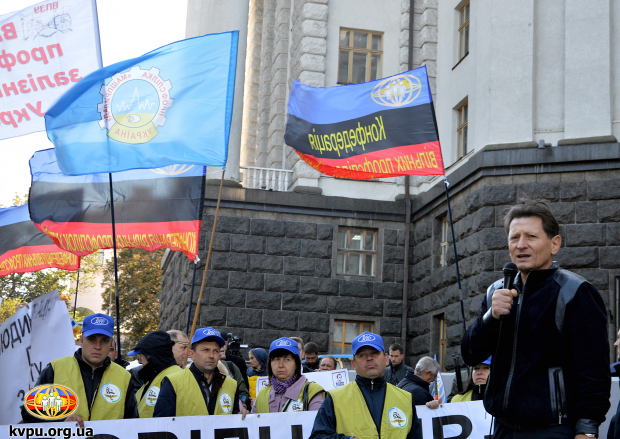 Representatives of Independent Trade Union of Coal Miners of Ukraine (NGPU) from “Lviv Coal Company” and coal mine 1 called “Novovolynska” who have the wage arrears of 14,5 million Hryvnas (around 700000 U.S Dollars) –three months’ arrears of wages –announced a hunger strike at the building of the President of Ukraine’s Administration. At the end of the demonstration the KVPU handed over a petition of the trade unionists’ demands to the Cabinet of Ministers of Ukraine.